Cucamelon is native to Mexico and Central America - where it is called sandiita because it bears tiny watermelon lookalikes small enough to fit in a teaspoon. It is a pretty, high-yielding vine with tiny leaves and small yellow flowers about four millimetres in diameter. They need a sheltered sunny site and can be planted 15cm apart to get the most out of a small space - thus perfect for the cottage garden. It will also do well in a hanging basket and can be grown on a bright windowsill in a warm living room. 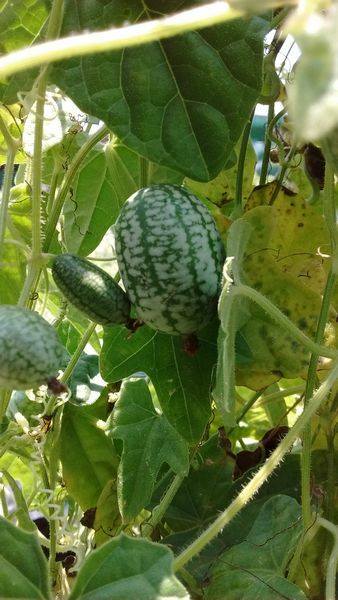 Cucamelons are delicate to begin - but they will soon begin to fill out and need a trellis. They are drought and pest resistant. 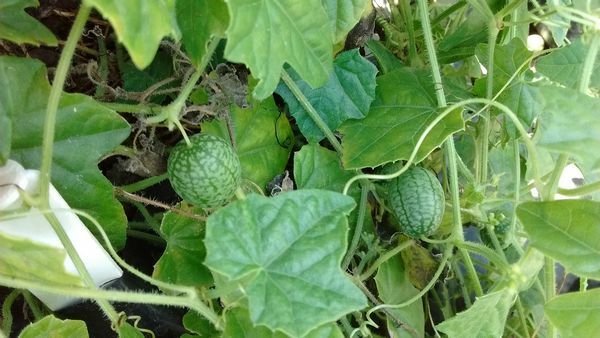 Cucamelon has the flavour of pure cucumber with a tinge of lime. They can be eaten raw in the same way as traditional cucumbers. Unlike regular cucumbers that must be peeled and seeded - there is no need with the cucamelon. For salads - choose small cucamelons less than 2.5cm in length that have not developed many seeds yet. Mix whole cucamelons (fresh, blanched or pickled) into a bowl of olives and serve with drinks. Spear them with toothpicks and pop them into a martini. They can be served with pretzels and chips. Taste good in a simple ham sandwich or with a fancy cheese-board. They are excellent in stir-fries and can be chopped and added to salsas for extra texture and flavour. Harvest cucamelons when they are the size of olives or small grapes and still firm to touch.